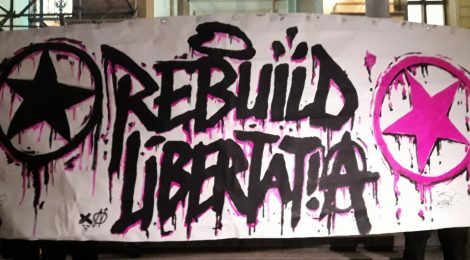 Call for transnational action in support of the Libertatia squat in Thessanoliki! Browse: Home / Call for transnational action in support of the Libertatia squat in Thessanoliki! We reproduce a call for solidarity from our comrades in the Anarchist Political Organisation (APO) in Greece. On January 21st, 2018, in Thessaloniki, during the nationalistic rally for the Macedonian issue, fascist groups attacked Libertatia squat, managing to burn most of the structure. The same day, fascists attacked the Free Social Space Sholeio and the anti- nationalistic demo in Kamara square. In the days that followed, the state, along with the ‘’deep’’ state, continued with a new series of attack in Athens: during the corresponding nationalistic rally on the 4th of February, 2018, when neo-nazi groups attacked the squatted theatre Embros. Attacks were also launched by the Golden Dawn stormtroopers on the 25th of February against the self-managing steki Favela, while the squat Lelas Karagianni 37 became twice the target of incendiary attacks, the first on the 13th of February and the second on the 30th of March. These attacks prove to us a methodical targeting of the structures of our struggle from the fascists. A targeting that goes hand in hand with state repression. Squats, as struggle structures of the anarchist movement, in the whole of Europe, have played a vital role for the growth and the evolution of the revolutionary movement. These attacks aim to terrorize and isolate us. In squats relationships of solidarity and equality are built, consciousness is created and revolutionary ideas are born. So, acknowledging their value, we will let none take them from us and we will answer accordingly to all attacks.In recent years we see repression and fascist attacks intensifying, both in Greece and in a pan-european level (Spain, France, Denmark, Italy), against squats, social centers and free social spaces. Therefore, we believe it to be an obligation of the movement to answer by protecting its structures. In the case of Libertatia, we cannot account the attack as the same like any other, the specific circumstances of that day give to the attack a unique character, as what happened that day could not be repeated any day. So, we consider it our duty to rebuild the squat. The rebuilding, for us, concerns the whole of the movement who stood against every fascist threat and dared to go out on the street as in Thessaloniki on the 21st of January so in Athens on the 4th of February and, consequently, it is a collective responsibility for all those who believe that fascism is destroyed openly, on the street. It is a chance to prove that solidarity can (re)build structures of struggle, to show by actions the endurance of our ideas. It is a part of the fight that stands as an answer to the state and the fascists, who, in that day, by exploiting the circumstances and mobilizing all their forces managed to build Libertatia. This choice was not random at all, since the squat has been repeatedly targeted for its antifascist action in the last years and has been again the target of attacks, of a smaller caliber. On the 21st of January the comrades of Libertatia together with the comrades of APO decided to not let the city become a hunting ground of the fascists and to stand against the enemy in a public, announced anti- rally against the nationalistic rally, showing this way that even in the worst days of nationalism’s paranoia, the people of the struggle are on the streets. This decision is, for us, of historical significance and constitutes a win for the anarchist movement.Motivated by our ideas for a society of equality free of oppression and exploitation and inspired by struggles that defended squats (Ryesgade ’58, Copenhagen ’87, Villa Amalias – Greece ’12 etc), we want Libertatia to continue and to become a symbol of the antifascist struggle. We believe that the completion of the project, as well as the process of rebuilding itself, will offer to the revolutionary movement, they will help bring in new ideas and they will shape consciousness. They will, also, provide a fitting response to the society as to who are we and what we are capable of doing. We are not the ‘’deep’’ state, the gangs and the forces of destruction but the world of solidarity and the forces of creation. And this is one more reason why we consider it a duty and a commitment to the movement to rebuild the building with our terms, with our hands, as a first response. The solidarity actions that began the day of the arson and escalated the next day in the whole of Greece and abroad, with their main point being the demo of the next day, 22/1/2018, which gathered 2500 people, continued for all this time and, for us, peaked on the 10th of March, in the panbalkan demo of solidarity which numbered 4000 people. This demo signals a first circle of solidarity actions with Libertatia and gave a strong message against the nationalistic rallies with the points of antifascism, antinationalism and international solidarity. In spite of the heavy blow, we do not forget that the threats of nationalism and war are still hanging over the Balkans and that it’s a duty of the anarchist and antifascist movement to confront on a central political level all those that want to rewrite the blackest pages of history. For us the only feasible solution is the anarchist movement to erect the barricades of internationalism and of solidarity between the oppressed and to give organized and fighting answers. One such important answer can and should be given with the defense of a structure that got attacked during the nationalistic rally and the most important part of this defense is the rebuilding itself, which can be achieved by the movement.We call the anarchist and antifascist movement to support this effort. More specifically, we call for a pan- european campaign of solidarity actions throughout October. We call every group, organization or person to organize actions (talks, demos, financial solidarity actions etc) in order to give collectively a resounding answer and a message of solidarity. Solidarity is what gives us strength to continue our struggle against the state, fascism and capitalism.